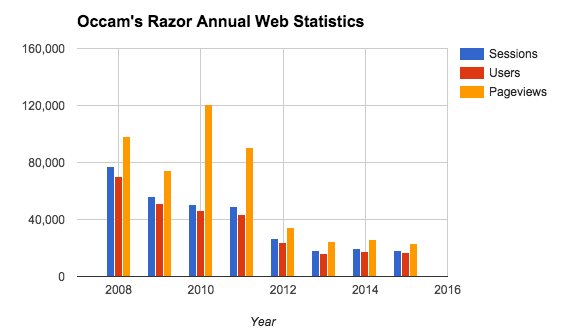 The end of Occam’s Razor? I’m approaching post 2000. As I move close to this auspicious number, it has occurred to me that this may be a good time to stop blogging. 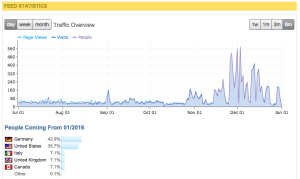 My traffic is way down and has been way down for years now, and keeps declining. But even if it were not, it’s pretty clear to me that blogging is not much of a thing anymore, at least not blogging as I have practiced it. Successful blogs these days are not collections of essays like this one, but for the most part contain short and punchy posts. That’s not my style. I use a popular WordPress plugin called Yoast, which helps boost your traffic by basically making your post more attractive to Google. I’m sure that if I took Yoast’s advice I probably would see more traffic, but it would also violate the spirit of my blog. This is a blog of essays and it aspires to be of interest to highly literate people capable of deep thought. Yoast though wants my posts shorter. It wants me to add more headings, pictures and links. It wants me to give short excerpts of the post for search engines. It wants me to use even simpler sentences to make it optimal for people with no more than an eighth grade education. Ironically, the same technology that elevated my blog years ago now seems intent on killing it. Search engines like Google (the only one that really counts) continually refine their algorithms, which they don’t share. What Google is looking for is relevance, an ephemeral quality. It all amounts to: is this site worthy of promoting in its search engine to advance the company’s profits? A blog of essays does nothing to help Alpha (Google’s parent company) increase it’s shareholders’ fortunes. Basically Google wants you to spend your life in search engine optimization (SEO) hell. You are expected to work ruthlessly to promote it at your own time and expense for the tiny chance that you will have enough “relevant” content for Google to send people your way. You are expected to master the complexity of SEO, which is basically impossible without paying a lot of money to consultants, which is increasingly making blogging a privilege of the rich. The result of this “relevance” strategy is to deprecate the very things about my blog that I want to retain. So by retaining this approach, I attract fewer readers. The really successful blogs these days are attached to successful sites, with Huffington Post coming to mind. The author is already someone of some prominence. They are broadcasting their stuff not just in a blog, but are constantly tweeting and posting to Instagram and pore through their site’s analytics to look for ways to make their site more attractive. Yoast tells me such with every post. Frankly, this is a game I don’t like playing, so I haven’t. So sixteen years of blogging may be enough. The Internet has moved on. Blogging is still a thing, but if Google has their way relevance means it must be of topical interest and take you into an area of specialization. With essays that mostly discuss current events, I am part of a huge pool of similar bloggers. An occasional post will get a fair number of shares or likes (it’s rare to get more than ten likes for a post) but comments are virtually nil. My first post was on December 13, 2002. My friend Lisa who beat me to it inspired me. Her blog is still around. But she is naturally more connected and sociable than I am, in spite of us both being introverted. Also, she posts a lot less frequently. Maybe I need to do something like that. So 2000 posts may be it, or maybe even this one (post 1987). Or maybe I should close it down on December 13, 2018, which would make it exactly sixteen years. We’ll see. If it shuts down, it will probably eventually migrate to wordpress.com where at least it will persist indefinitely, but at someone else’s expense. It’s unlikely though that I would stop putting my stuff out there in some form. I might try podcasting or nibble at vlogging (video blogging), but both take more work than I am likely to want to engage in. If so, I will assume a new persona. Perhaps by looking fresher I will attract more readers. 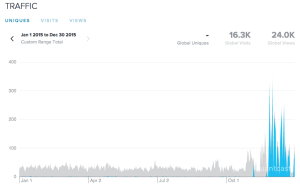 Sixteen years is a good long time to ride a trend, but it’s abundantly clear to me that blogging is a trend that has been petering out for a while now, being killed slowly by our search engines. And I won’t pay the price in time and treasure to be relevant the way that Google wants me to be. Shame on me I guess, as I teach CSS and HTML and most things web and should have fixed this stuff years ago. I’m just strangely apathetic about fixing these things as I like things to look just the way they (mostly) always have been. So I have reluctantly updated my blog’s style to something more traditional and pretty simple, cutting down a lot on the clutter in the sidebars. In fact, I’ve moved from two wordy sidebars to just one. So hopefully it is more usable and Google will start ranking my site a little better. My stats have been miserable for quite a while, and this may be the result. I should care more but I just don’t. None of this makes any difference to you, I suspect, unless you visit so often that it also seems jarring. Perhaps I will get used to this one on this blog. I already use it on another site I manage. I couldn’t give up on the Rodin’s “The Thinker” image though, something of a signature for my site. So a little hacking of the WordPress template and a couple of CSS style changes and it at least is back and consistent. It will take me a while to get used to it, however. And I’ll miss the old style. I just couldn’t find something dark that was both acceptable and not a huge hassle to retrofit. It’s not the least bit obvious to you but this blog is now coming to you from the cloud. My move to cloud computing is but my latest adventure in hosting. This blog has moved around so many times in its nearly fourteen years even I don’t remember all the places it’s been hosted at. For at least the last four years or so my sites have been hosted at Hostgator on its generally inexpensive shared hosting for about $15 a month (plus an annoying $4 a month for a dedicated IP). Today though you are being served my fresh content from the cloud. Yes, I am using cloud computing at last, rather than a server in a server farm somewhere. Actually a server farm and a cloud-computing center look pretty much the same except the cloud-computing center is likely a lot bigger. Even I have no idea exactly where my words are coming from, but rest assured they are still sent from a machine on a rack deep in a hosting center somewhere. All I really know is my blog comes from a gridserver.com domain, which is owned by MediaTemple. “Owned” probably does not apply here. I’m using MediaTemple’s Shared Grid, which is actually Amazon Web Services. I know this from calling their support and asking the question. While MediaTemple still has hosting centers, they have outsourced their shared hosting to AWS. MediaTemple is not alone. Oddly enough most major web hosts are outsourcing a lot of their hosting to someone who will do it faster, better and cheaper in the cloud. This is probably Amazon Web Services, but they are not alone either. Google and Microsoft are the two other major cloud providers and there are a host of smaller ones. I’m in the cloud in part for cost but also because being in the cloud I get more value. MediaTemple’s Shared Grid service uses all solid state drives, which means there is none of the latency that exists from retrieving content off a disk drive, which requires moving disk platters around. So all things being even, response is faster on this hosting. Readers should also be “closer” to my blog: six routers in my case instead of sixteen to get through between server and browser. (Static content comes from a content delivery network I pay $9 a month for.) So now it’s like going through six stoplights to get to a destination instead of sixteen. A properly managed cloud-computing center also takes care of a lot of the hard stuff, mostly through advanced engineering. Outages are far less likely; patches are less likely to incur downtime. In general readers like you should expect faster response and fewer quirks and issues. Where vendors like MediaTemple add value is by making using the cloud quite simple. If you were to buy an Amazon EC2 service, you would be expected to manage much of it yourself, including security and upgraded to the operating system. Amazon handles the backend stuff, but MediaTemple wrote a nice friendly wrapper with its control panel so I can use it without thinking too much. It is still technical to administer my sites at times but most stuff can be done elegantly inside its control panel. Rehosting though is still a pain, which is why I’ve avoided the hassle and waited until my Hostgator contract was ready to expire. This is one of five domains I own. Moving each to the cloud is hardly a trivial process. It means moving masses of files around and in most cases exporting and importing a database, skills not easily acquired. I also have to edit a number of files to make the integration between programs and databases work. This all takes time, attention and a certain amount of geeky skills that I happen to have. Since I can get this for a fair price (up to 100 domains for about $20 a month, with obvious overall resource quotas I am unlikely to exceed) my hope is this will be the last time I have to rehost. I’ve been plugging away at this for more than a day and my most challenging site still has to be moved. To move that I’ll also have to integrate a certificate first so that content can be sent securely. In general though I am following the trends. At some point traditional hosting will be obsolete. It will all move to the cloud and probably hosted by Amazon, Google or Microsoft. You won’t know or care who’s doing the heavy lifting. Vendors like MediaTemple and HostGator will distinguish themselves by writing wrappers around cloud hosts for an optimal customer experience and by working with cloud providers so that the infrastructure can be highly tuned for their customers’ needs. For you and me, reading my blog should be a faster, less quirky and a more reliable experience.